I read David Shipler's The Working Poor for a book discussion group I helped lead about economic oppression and its impact on quality of life. The book tells the stories of numerous working-class people and their families, detailing the struggle to make ends meet and how easy it is to slide down a very slippery slope. It also touches on how government assistance helps, but not enough, and how many companies take advantage of the poor, charging them huge fees they cannot afford. I read Barbara Ehrenreich's Nickel and Dimed some years ago and it really rubbed me the wrong way. I found Ehrenreich abrasive, confrontational and not in the least easy to sympathize with. I much preferred Shipler's book. He lets people tell their own stories. He doesn't embellish, but provides context for very disturbing and startling statistics. I have spent my whole life in the upper middle class. I worry about my retirement, not my next meal. I have never spent more money than I earn. I have never been in debt. I am aware of how lucky I am, and I know how much more difficult life could be. And how quickly things can change. So this book wasn't what I would call "eye-opening," exactly. I say that because I am aware of how many problems there are in America. But while this book did not open my eyes, I think it served as a book version of an eye exam. The Working Poor clarified many points for me. It increased my understanding of social economics and just how much circumstances can snowball, to disastrous effect. There were some very powerful stories in this book. Some were powerful in a positive light- the single mother who instilled a love of culture and education in her children even though she herself had to declare bankruptcy. Some were horrifying and chilling. For example, people at the bottom of the socio-economic ladder are less likely to show affection to their children because they never received affection from their own parents. Also, most people at the bottom are single women raising children. And the percentage of those women who had been sexually abused as children is terrifyingly high. Facts presented in this book made me heartsick. There are so many things that can go wrong in a life. There are so many decisions that may seem inconsequential but then have enormous repercussions later on. It is so easy to give up and almost useless to try to raise yourself again and again. There were men and women I met in this book who had such amazing work ethic, and such a drive to make life better for their children. And yet there were others who, over and over, made stupid decisions that hurt themselves and their families. And I think that was something I really struggled with. Compassion is important in situations like these, but sometimes, it seems almost like coddling. It seemed like the most effective way of motivating some of the people was to give them a hefty dose of realism and a big kick in the rear. I think what spoke to me most was the theme implied by its subtitle, Invisible in America. Think about that for a moment- going through your whole life doing a dead end job with no benefits, no chance for advancement, and no sense of accomplishment. The sort of job in which people see you and then immediately forget you, and you think that maybe if you don't show up tomorrow, no one will notice or care. It would be devastating. It is devastating to a good number of people. And that struck a chord. That so many of the people profiled in this book felt like they did not matter. And felt so defensive, so unwilling to form real connections and friendships with others for fear of getting burned. The Working Poor may not change my behavior. (To be frank, I have no idea what I can really do to help solve such a huge socio-economic problem.) But it made me realize how precarious financial confidence is. And for that, I think more people should read it. You just need a string of bad luck to careen off-track, and it is so, so hard to get back up again. It's easy to sit on your high horse and say, "People who are on welfare just don't work as hard as I do," but that is blatantly false. They do work hard. But they just don't have the education or the specialized skills to advance in a career the way they want to, and because of that, there is just a deep and painful hopelessness in them. It's so sad to read, and I think it's important we all understand how it happens. I've always meant to read Nickel&Dimed - I think I will read this one instead. Loved this review, thank you. Great review. I agree with Care that I think I'd rather read this than Nickled & Dimed. I am currently reading The Missing Middle which focuses on similar issues (lower middle class families working just to make ends meet). So far it sounds like it might give solutions of some kind so I may try to read this one as well to get more of an idea of the situation. I think it is important for people to understand that these people do work hard and try their best they just don't always have the opportunities they need. This does sound like an incredibly powerful read. I have been on both sides of the economic divide and it is only by a few strokes of luck that I made it to the other side, so I think reading this book would probably answer a lot of questions for me. It's funny just how closely some people ride the ragged edge of disaster. It only takes a few missed paychecks to permanently pull a family under, and I feel like we are very lucky to have had a safety net to fall back on. This review was wonderful, and this is definitely a book that I want to read, so thanks for sharing it with us!! This sounds like a book that should be read to make more people aware. Like yourself, I have never had to worry about where my next meal is coming from and I do feel grateful and very fortunate. This type of book makes me want to go out there and help everyone I can. I joined a suicide hotline shortly after Hurricane Katrina, and that was what really gave me an understanding of the challenges that people face when they are poor, come from backgrounds of poverty, etc., and then what happens when even the minimal safety net that they have (their community, the social service agencies near them) is taken away by a disaster like Katrina. It's easy to have an intellectual understanding of things like that, but I think what volunteering gave me was emotional understanding; and that emotional understanding, I think, is what a lot of people lack. Because it's hard to sympathize with statistics. Listening to the callers tell their stories can be absolutely heart-wrenching, especially when you know you can't help them in any long-term way, and that all the social service agencies in town are tapped out. Awful. Care- Nickel & Dimed just wasn't for me. Ehrenreich and I don't get along, I don't think! But lots of other people like it. I just preferred this format better, as it's about REAL people struggling day-to-day. Amy- I haven't heard of The Missing Middle, but I'll definitely look for your review when it comes up! Zibilee- That's one of the things mentioned, actually- that a family support system can be such a lifesaver! Vivienne- In SOME ways it made me want to help a lot of people, but in others, it really frustrated me with the people who seemed so beyond help. Who saw themselves as victims and were just so destructive. I don't want to help them, really. It was a hard book in that way. Jenny- Gosh, I can't even imagine... That sounds like a very powerful experience, and I know you must have helped so many people! I agree the emotional understanding is separate than just the factual one. I'm so glad you read this book and highlighted it on your blog. The working poor are truly the forgotten people in this country. I like you was born into an upper middle class family and enjoyed plenty of privilege. Although I became a single mom when I divorced 13 years ago when my son was 3 I was blessed with a really good job with great pay. I can't imagine how I would have had to struggle otherwise. I'm definitely going to read this one! You got me when you said he lets people tell their own stories. I think that is the most important thing in an "issues" book, and usually the difference between my liking it and not. Documentaries too, come to think of it. Thanks for your review! I have read both The Working Poor and Nickel & Dimed, and I much preferred The Working Poor - it felt more analytical, more factually-based, and much more educational. 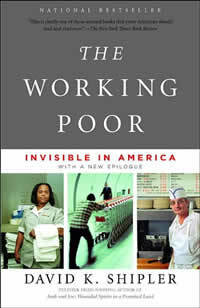 The book also affected me tremendously because my parents are in the class that I would call the working poor too. My entire life was a financial struggle, and I remember how painful it was to watch my parents work so hard yet yield little tangible result. (food on the table was about as good as it got.) So I worked really hard for my own personal financial success, going to college and all that to secure a career for myself. Long tangent, yes, but the point I'm trying to make is that I totally "got" this book and it really resonated with me. I'm glad to see that others are reading it too. Thanks, Aarti! Kathleen- I'm so glad! I found it very important to read and give myself perspective. Trapunto- YES, absolutely! Much better than people putting words in other people's mouths. Heather- I'm glad I'm not the only one who preferred Working Poor. Definitely more analytical with serious hard data to back up his facts. I'm glad that you were able to "get out" as it were- from what I can tell, it's hard to do so, and I'm very impressed with you! Really great review! I didn't have the same reaction to Nickel and Dimed as you did, but definitely agree there were some limitations. I think your point about showing how precarious financial security is would make this a book worth reading. Now I have to go find it! Peole who think that should try being on their feet all day, every day - working in a shop or cleaning toilets or working in a cafe or standing in a factory production line, and all for minumum wages too. That's my family background (dad worked in a factory)- and then dad died and we were even poorer than we had been previously!But I made the decision when I was eleven that I was going to go to University and escape - and that's just what I did. But this was back in the days when there were no tuition fees and I had a full grant. Government has a huge role to play in terms of education opportunities - making it easier for people from poor families to advance - and jobs - setting realistic minimum wages, taxing the richest more than the poorest to fund this (Funny how it's always the richest people who squeal loudest at the thought of tax increases, isn't it? Yet they are the ones who get listened to), but individuals have to take responsibility for their own actions, too. Life is for living, not surviving. Your constitution enshrines the right of people to be happy - to me happiness means being able to live in hope, not fear - no-one can live easily with that damoclean sword - of not being able to pay the rent/not being able to afford shoes for your kids/having to live in a really rough neighbourhood and fearing your kids will end up in gangs and being killed in drug wars - hanging over them. What a fantastic post and book to highlight, Aarti. I too am upper middle class - but my parents are both from working class families and my dad worked hard to educate himself and build his own business so we could enjoy the privileges he never had as a child. A lot of my family are still working class and struggle to get by, and it's hard to know what to do about it. It's the sense of hopelessness people trapped in their poverty feel that most touches my heart. They work so hard, but because they have had few opportunities for education, they're never going to rise above a certain level or earn enough money to get themselves out of poverty. And the cycle continues with their own kids. Working so many hours and having so few comforts makes you miserable and hopeless and angry, and then you have kids growing up in that atmosphere and that attitude rubs off on them. That's why you get gangs of angry kids who are so messed up they just want to hurt other people. I think access to good quality, free education and extracurricular activities, as well as free college places, are the key. In the UK it's not as expensive to go to university as it is in the US, but you're still looking at thousands of pounds of debt - what working class child who isn't an academic genius and can get a scholarship is going to ever be able to aspire to that? The cost of education effectively excludes the majority of people from bettering themselves and that is wrong. Kim- To be honest, I think most people didn't have the same reaction to Nickel & Dimed as I did! Tracy- I definitely think government has a big role to play, but as the book points out, so do employers. It seemed in the book that a lot of employers weren't willing to listen to their employees about problems or difficulties, and that made me sad, too. As for taxing the rich- I always feel of two minds about this. I think there is sometimes this idea that the rich do *not* work hard, but my dad has worked 70-80 hour weeks every working week of his life and in my opinion, he DOES deserve not having to worry about his retirement (which he does, constantly) or see more than half his income taken away to fund inefficient government programs (which it is). I don't think that the rich should have to support everyone else, just because they DID manage to succeed (my dad is also from a very poor family). And I think that is what was so hard to deal with in this book. While some people tried really hard, there were just as many who basically gave up and depended on welfare to support themselves. bookssnob- I think we may come from similar backgrounds! While my mother was wealthy growing up, I would say most of my family still in India is very much working class, leaning towards poverty more than not, and I know they all depend on my dad and uncle for a lot of things. I definitely think the education thing is HORRIBLE. Moreso in the US than in other places because of just how much we have to pay to go to school (though, granted, we do have many different tiers of school for people to attend). And, I found out in this book, even if you declare bankruptcy, your student loans are NOT forgiven. So even if your degree doesn't help you achieve anything financially... you still have to pay for it all. I would love to get this book. I'm very similar to you and booksnob in that I grew up middle class, but my grandparents were working class, my mum was the first to go to uni etc, etc I don't want to play on roots I never really experienced. But it frustrates me that so many people believe that if you live in a council house you must be on benefits, if you're on benefits you're scamming the system (ha don't make me laugh, job seekers allowance is pitiful). I was on job seekers for 6 months and the lack of hope that place offers to anyone is just so depressing and yet everyone blames the seekers, instead of the institution set up to support them. I can't imagine what my life would have been like if I hadn't had the educational background to secure me a job. It also bugs me how many self made people are the first ones to call people who are in a similar situation to where they used to be scrougers. This sounds like a great book. I do like non-fiction that tells real stories. Really good review. I can see how important this book is to read, like you said, if not for opening the reader's eyes, at least to create a stronger awareness. It irks me when I hear someone say that the poor people don't work as hard as the so-called educated people do. During my stay in Kerala, India, I have seen some very hardworking women who couldn't write a word, barring their own names. They would come to clear our backyards, carry heavy bucketfuls of water, fetch hay and do many more strength-requiring tasks. On the other side, I've seen people with education and earning a hefty paycheck sit lazily on their comfy chairs and chat with the whole world, passing the time. It's funny, but I cannot fathom sometimes how some people can be blind to the poor people who work hard. That said, the picture cannot be generalized. There are "poor" people who don't "work hard", and then there are the hardworking people who have never had a worry in their lives. It takes all kinds, I guess. I'm adding this book to my TBR. Thanks for the insightful review. I too may substitute this author for Ehrenreich in the classroom. As someone who writes about the working poor of the past, I'm convinced we all have a lot to learn from them. In this culture, to disconnect self-respect from financial success but still maintain values and ambition: talk about grace under pressure! That kind of arrogance, of dismissing poverty as a direct result of laziness and smugly looking down on anyone not doing as well as yourself, is one of the things that upsets me THE MOST in the whole wide world. And there's no shortage of things that upset me :P This sounds like one incredibly powerful book. Jodie- The things that frustrate you frustrate me, too! And I also think a lot of self-made people look down on others. In a way, I can understand the "If I can do it, anyone can" feeling, but there are just so many other circumstances involved in lives that one can't judge. Aths- Yes, it's funny how now it seems manual labor isn't deemed to be "hard work." It's sad, really, the way people think that sitting in front of a computer all day or having a JD or an MD or something like that is what it means to work hard. Shelley- You're so right. It is HARD in this day and age to see yourself as successful unless you have money to spare. It's a lot of pressure to do what you THINK you should do, and not what you WANT to do. Nymeth- It was very powerful, definitely! Upsetting in multiple ways, but powerful for certain. And it upsets me a lot, too. Really, the whole smugness routine upsets me generally. Wonderful and thought-provoking review! I read "Nickel & Dimed" and it seemed too gimmicky to me in many ways. And I'm with you .. I don't quite know what I can do about this problem other than be aware of it and help out any kids I might encounter along the way that might need a little bit of support and recognition and encouragement from a grown-up. This sounds so good. I was studying about turn-of-the-century Chicago poverty -- and I have book called How the Other Half Lives published 1912 or so. Sounds like this is the parallel, for today. Fascinating sounding, even if it won't surprise me. Sounds necessary--like those eye exams. Jenners- I think your way of helping is really the only way we can make a difference, too. It's important to focus on individuals, not be overwhelmed by everything. Rebecca- how the Other Half Lives sounds important, too, particularly as it's in Chicago! Thank you for the tip. As for taxing the rich- I always feel of two minds about this. I think there is sometimes this idea that the rich do *not* work hard, but my dad has worked 70-80 hour weeks every working week of his life and in my opinion, he DOES deserve not having to worry about his retirement (which he does, constantly) or see more than half his income taken away to fund inefficient government programs (which it is). I don't think that the rich should have to support everyone else, just because they DID manage to succeed (my dad is also from a very poor family). Sorry, Aarti, it wasn't the middle-classes like your dad I was thinking of,(it's the middle classes who tend to get really hammered by tax increases) it was the really rich - those ones who employ accountants to sniff out any tax-loophole going, the ones who have all of their money stashed in tax havens.